It’s late at night, and Tina and I have finally made it back to our hotel room with a whole range of emotions. It’s been both a heartwrenching and exciting day for the Canadian Team here at Greenwich Park. Exciting because Jill Henselwood, Eric Lamaze and Ian Millar looked brilliant in the first day of the team medal competition which has qualified Canada for tomorrow’s final. And heartwrenching because of the events which unfolded throughout the day which led to Tifffany Foster’s disqualification with Victor. The official press release is out on the COC and Equine Canada websites, so I will leave you to Google that and read the full release. I have much to say about it, but will leave that for a more appropriate time. For now, I hope that everyone will throw their support behind Jill, Eric and Ian as they ride their hearts out tomorrow. Canada’s has done it before when the odds were not in our favour, and I have no doubt they can do it again. And I know I’m not alone when I say that our Canadian Equestrian Team (Eventing, Dressage & Jumping) has shown the absolute epitome of class, grace, and downright true grit in the face of adversity and heartbreaking disappointment. They say the Olympics are full of tremendous highs, and gutwrenching lows. I also believe that it shows the true character of people, and just what they are made of. 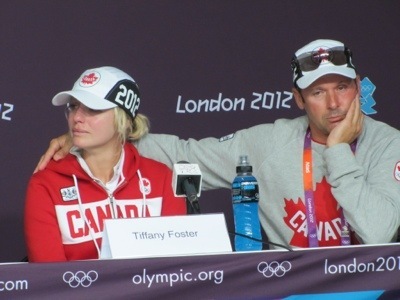 Today, Tiffany Foster was one of the strongest people I have ever had the pleasure of knowing. I can’t even begin to imagine the emotional rollercoaster that was her day today….and yet through it all she held her head high, and faced it head on. And even though her Olympic journey ended abruptly and before it’s time today, Tiffany showed she is a fierce athlete and worthy of the title “Olympian”. She gained the respect and the hearts of her fellow athletes as well as all those around her. And I know there is an entire nation back home who will always consider her to be a true hero in sport. As always, I am humbled by the sheer determination, talent, style and class of our athletes. This picture says it all….and sums up exactly how we were all feeling. Rollkur has been BANNED by the FEI at all FEI competitions, but the internet has photos of this use, in BROAD daylight, and being used prior to entering the dressage ring and being given high scores. The FEI can no longer hide behind these rules of convenience. If we bring this to their attention, Tiffany should be able to ride!! Why over look one rule ban and not another?!?!?! What we are speaking about horse ‘cruelty’, HOW are they ignoring rollkur photos and practice and NOTHING is being done?!?!?! Chin up Canada–you are playing by the rules!!!! Chin up Tiffany! Your tears of anger and disappointment must not wash your dreams away. You are not letting your team down, you did a great job and had no part in what unfolded yesterday, which is understandably all the more frustrating. By accepting the decision against all your instincts, you showed fair play and made us proud. I have the feeling that we will see more of you in many future Olympic Games, and this sad experience will make you much stronger. Glory is merely postponed, there is no doubt that you will have your share of it.